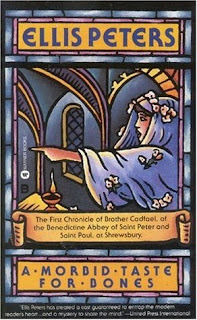 Our Whodunit Bookology detective of the month is Brother Cadfael created by Ellis Peters aka Edith Pargeter who is originally from the United Kingdom and passed away October 14, 1995 at the age of 82. Brother Cadfael came to life in A Morbid Taste for Bones through Peters interest in Shropshire history as well as herbs and gardening. The series includes 4 prequel short stories and 22 books and takes place during the 12th Century between 1135 and 1145. 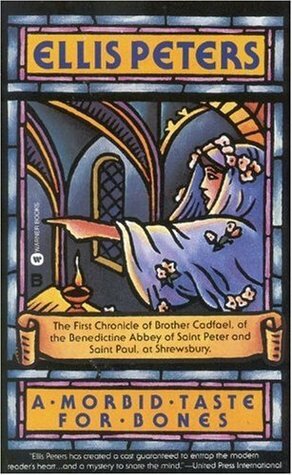 Cadfael, born May 1080 in Wales, was a soldier in the Crusades, a man at arms on a English war ship, and sired a son during the war before he became a Benedictine Monk at middle age and lives at the Abbey of St Peter and St Paul, currently known as the Shrewsbury Abbey in Shrewsbury, England. BW11: 52 Books Bingo - Something Borrowed.